Although Labor Day has come and gone, it’s still hot enough in Massachusetts for me to want a light, summery meal. 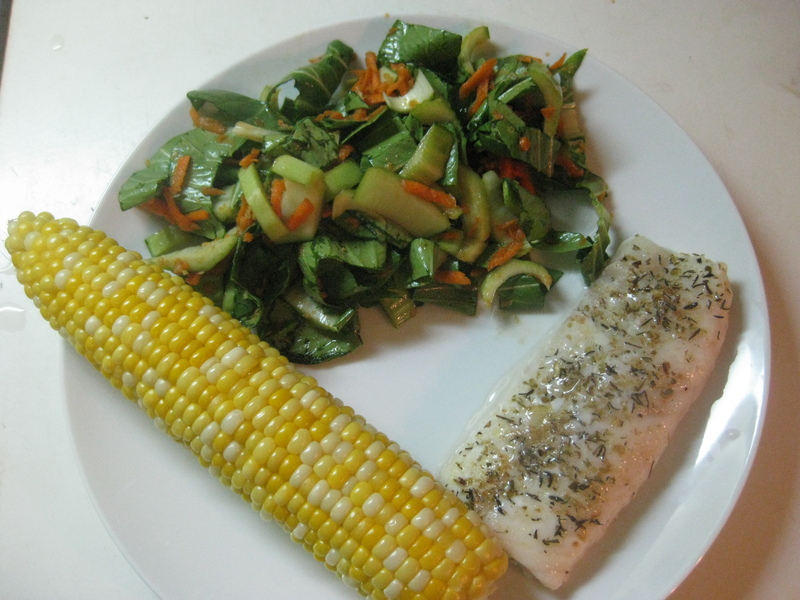 White fish is so easy to cook, and the corn is still sweet this late in the season. This is a simple meal, but using fish instead of chicken makes it feel more special. Also, fish ends up being easier to cook and clean up after, as long as you put the wrappers in the outdoor trash immediately to keep your kitchen smelling fresh. 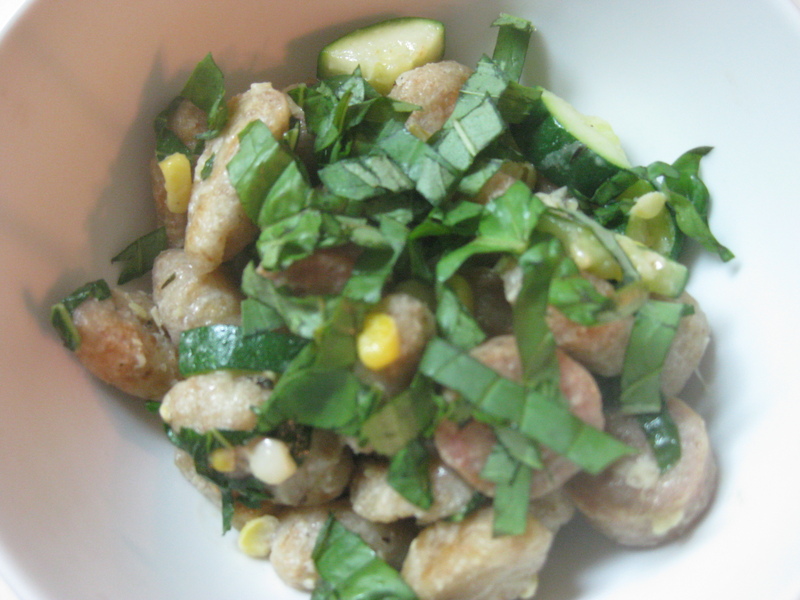 I served this with a side of Sesame Bok Choy Salad, but any vegetable side dish will work. Take advantage of your farmers’ market while it’s still flush with produce! Also, feel free to cover the side with cheese since the rest of this meal is so healthy. Preheat the oven to 350 degrees, and set a large pot of water on high heat to boil. Shuck the corn, removing as many silks as possible with your fingers. Rinse, snap off the ends of the cobs, and set corn aside. Line a baking sheet with foil, and spray with olive oil spray. Place the fish on the sheet, and sprinkle with the spices to taste. Bake fish for 15-20 minutes, until the middle is warm and opaque. 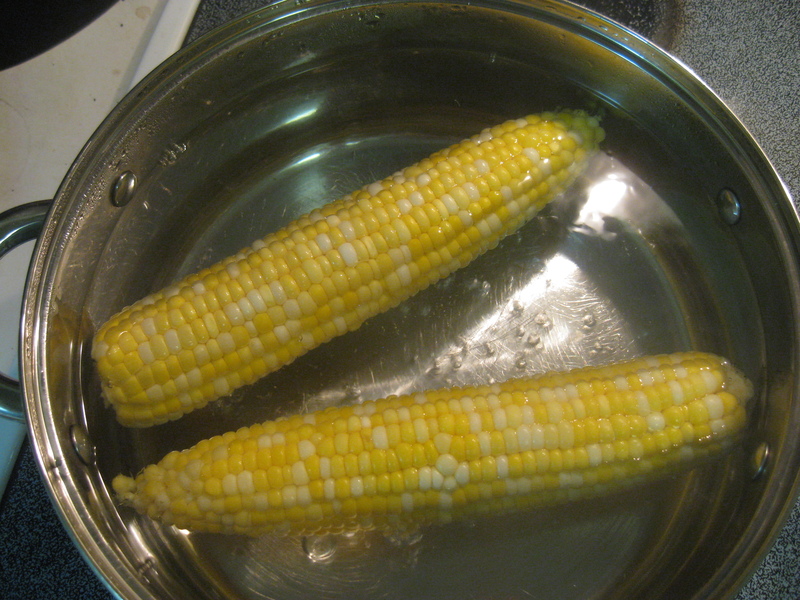 When the water comes to a boil, add the corn cobs. Cook for 5 minutes, bringing the water back to a boil during that time. Remove corn from the water after 5 minutes. Fill two plates with fish and corn (and a side salad, if you wish), and enjoy! Serves 2. Active time 10 minutes; total time 30 minutes. This recipe is an easy way to get greens into your diet—and it’s delicious! Chard is my favorite green because it tastes buttery when cooked. I use the red or rainbow variety because the colors are pretty, but the white stems taste just as good. Chard leaves are deep green with veins that thicken as they approach the stem. Before you start cooking, separate the stems and leaves, as the stems take longer to cook. 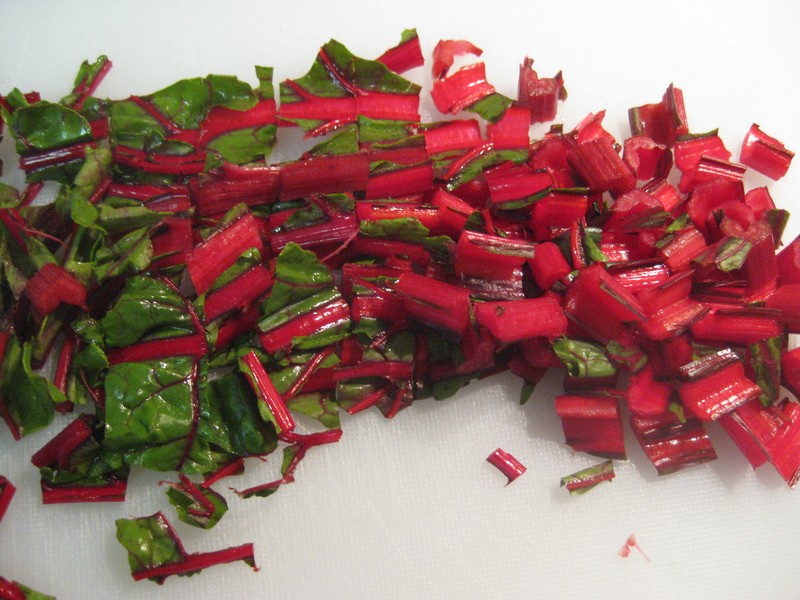 The red stems smell like beets when they hit the pan and start to sizzle! 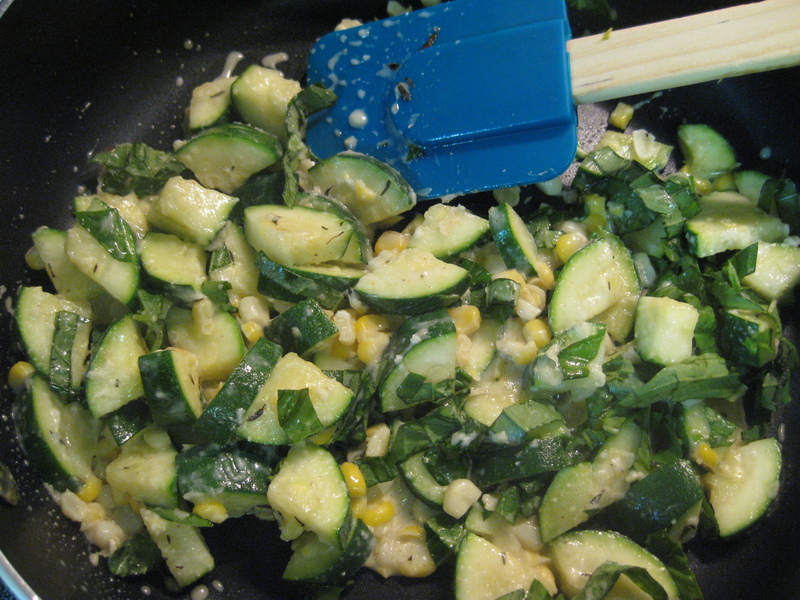 I usually cover the pan once I add the leaves, and the steam helps them to wilt quickly. 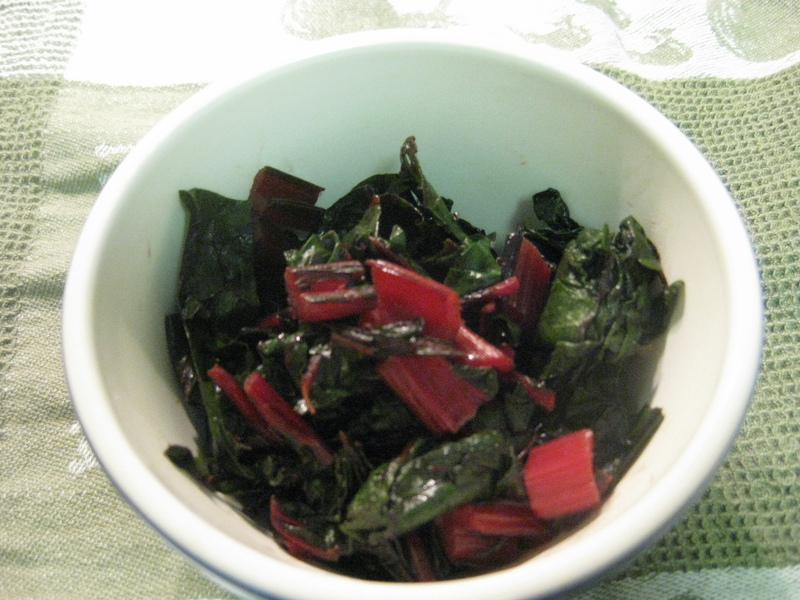 Chard has enough flavor to be eaten plain, but I wanted to jazz it up to serve to guests. The lemon-infused olive oil did the trick; lemon zest would work, too. I served this with chicken and mashed potatoes, but it also works as a bed for fish or even as a side for eggs. 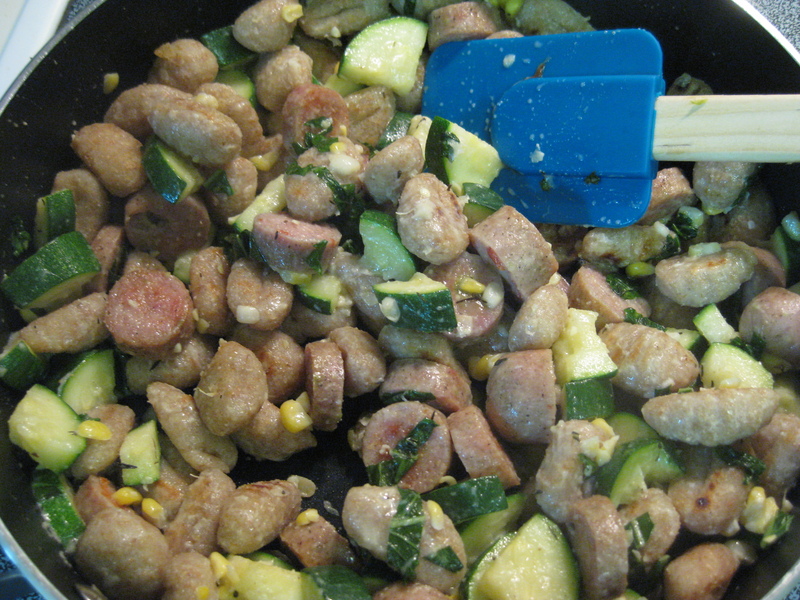 If you have leftovers, stir them into pasta or soup. Separate the chard stems from leaves. Rinse everything and dry very well in a salad spinner. Cut the stems into 1-inch pieces, and cut the leaves into 1-inch strips. Heat the olive oil over medium in a large skillet. 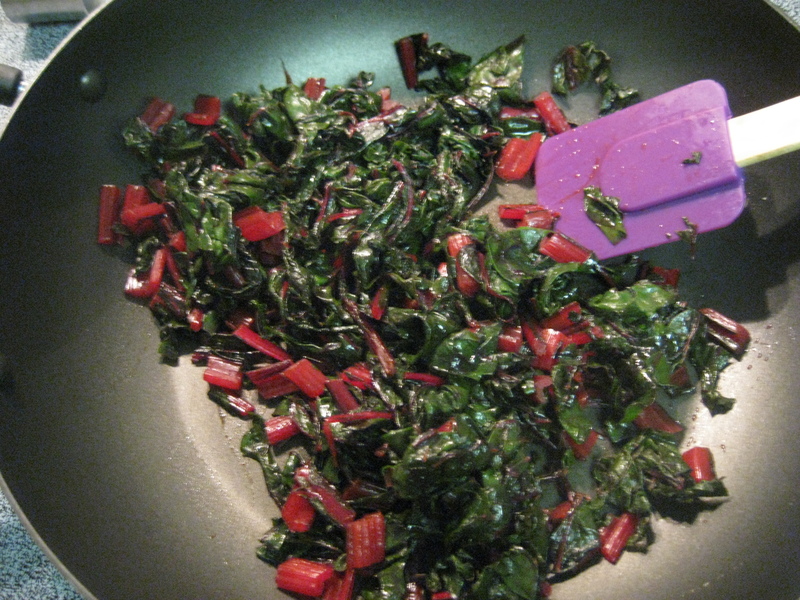 Add the chard stems and saute for 5 minutes, shaking the pan occasionally. 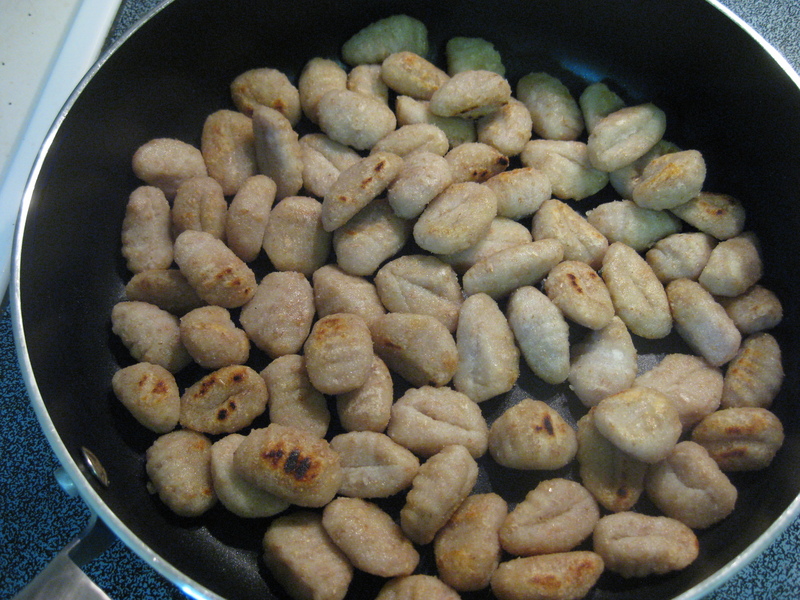 Add the leaves and cover the pan. Cook for another 5 to 7 minutes, stirring occasionally, until the leaves wilt. Add the lemon oil, vinegar, and salt. Cook for another 2 minutes on low and serve. I’ve never liked alfredo or anything with a creamy, buttery sauce. Cauliflower-based white sauces are often billed as fake-out, low-fat alfredo, but this recipe is much better than that. Its depth of flavor surprised me. You’ll need an immersion blender if you want this dish to be easy to make—but a regular blender works if you’re willing to make a mess. Either way, be sure to blend the sauce for a few minutes to make it smooth and to fully incorporate the liquids into the cauliflower. 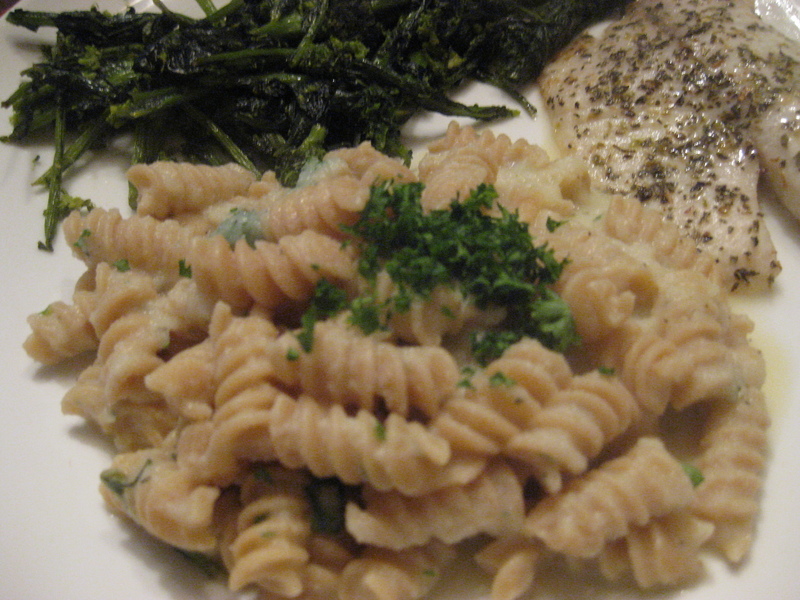 I served this over whole-wheat pasta, along with tilapia and sauteed broccoli rabe. Dinners don’t often include 3 dishes or look so formal in my house, so I savored every bite. I used 2 cups of sauce to cover 6 ounces of pasta, and that was enough to serve 3 people as a side dish. I froze the rest of the sauce and look forward to heating it up for an easy weeknight dinner. In a large pot, bring the broth and water to a boil over high heat. 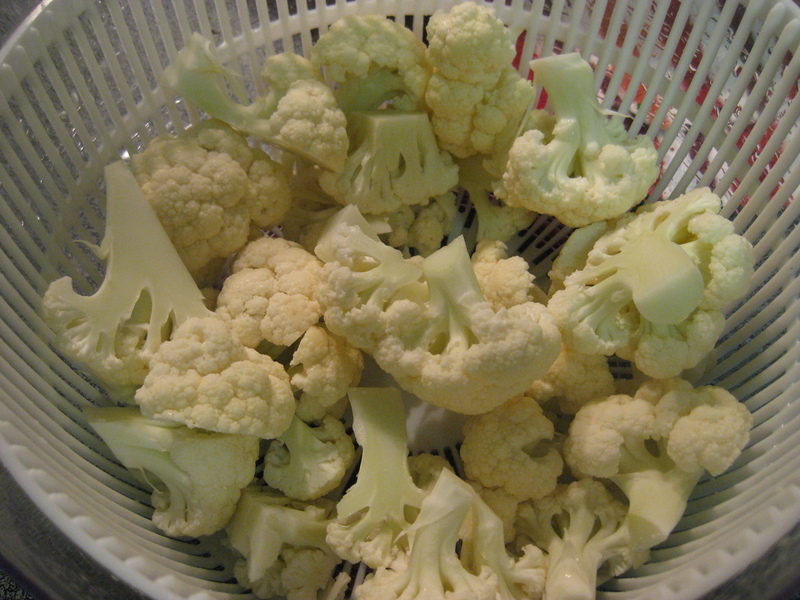 Wash the cauliflower and cut it into florets. Add the florets to the pot, return the liquid to a boil, and cook, covered, for 12 minutes. The cauliflower should be easy to pierce with a fork. Reserve 2 cups of the cooking liquid, and then drain the cauliflower. Add 1 cup of cooking liquid to the hot pot, along with the cauliflower, oils, salt, onion powder, thyme, oregano, and milk. 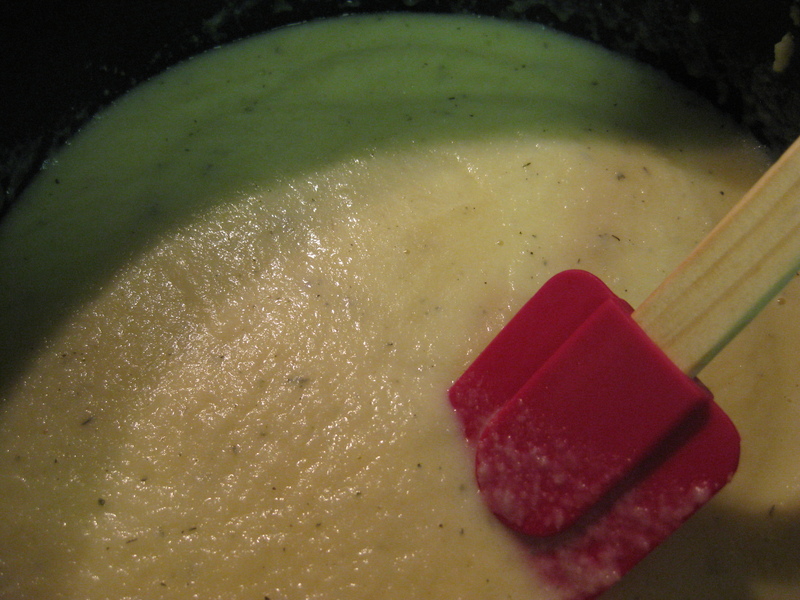 Puree well with an immersion blender, adding more liquid as needed. (I added about a quarter cup during blending.) The sauce should be very thick, particularly if you plan to use it on pizza. Stir in the parmesan cheese and serve the sauce over pasta. (The recipe makes enough sauce to cover 12 to 16 ounces of pasta.) Top with parsley and more grated cheese. This soup is so rich in texture, and with hardly any fat. It’s the type of soup you have to scrape out of the pot. 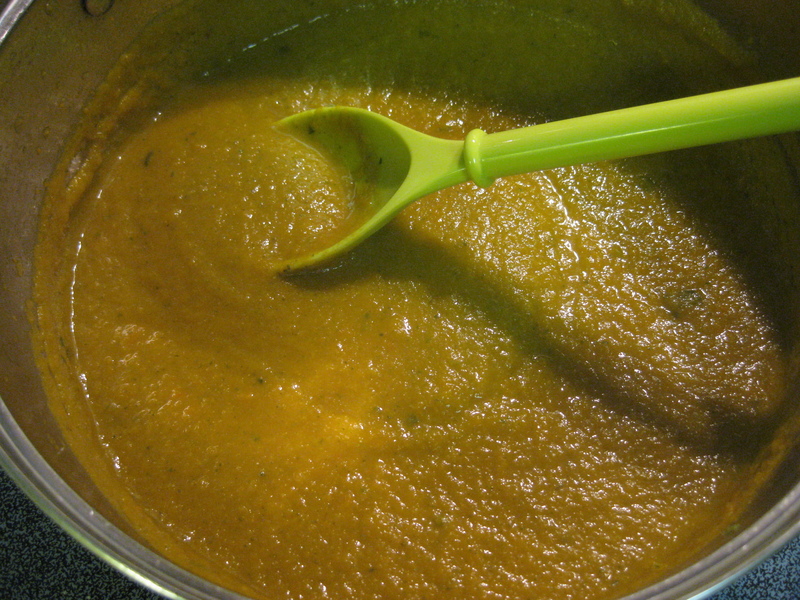 The trick is to blend it for a long time, allowing the immersion blender to whip water and air into the carrot mush. I couldn’t believe the textural transformation that took place after about a minute of blending. I made this soup using Trader Joe’s frozen Parisian carrots. These carrot balls are naturally round and quite cute! I don’t often buy frozen vegetables, and after these sat in my freezer for months, I knew I would never get around to roasting them. When used in the soup, I couldn’t tell the difference between fresh and frozen. The carrot flavor is strong and bright in this dish, and the miso adds an interesting backdrop without tasting definitively Japanese. If you want to get fancy, either sesame oil or lemon oil can act as the final flourish. Sesame oil gives the soup a sushi-restaurant feel. Alternatively, lemon oil feels fresh and springy. Either way, this is a warm, creamy bowl of goodness. Heat the olive oil in large pot over medium-high heat. 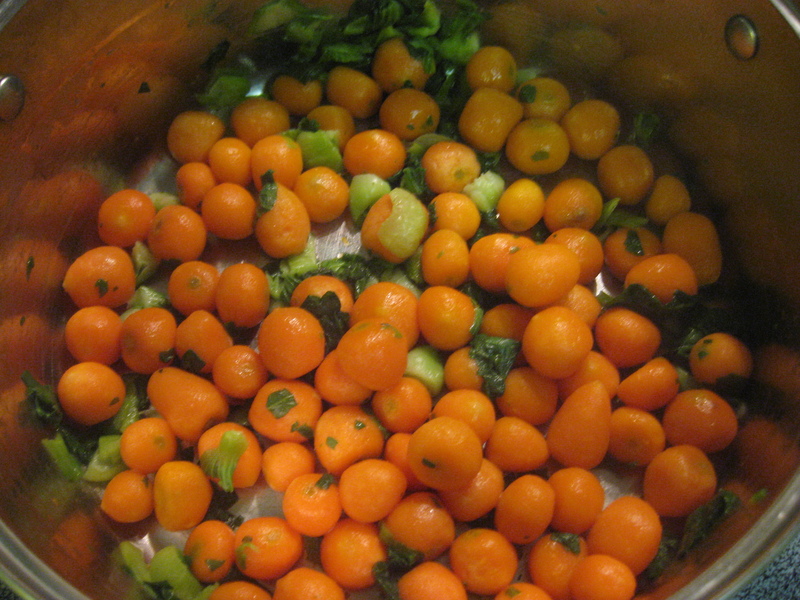 Add the carrots and bok choy, and saute for 10 minutes, stirring frequently. Add the onion powder, coriander, broth, and ginger. 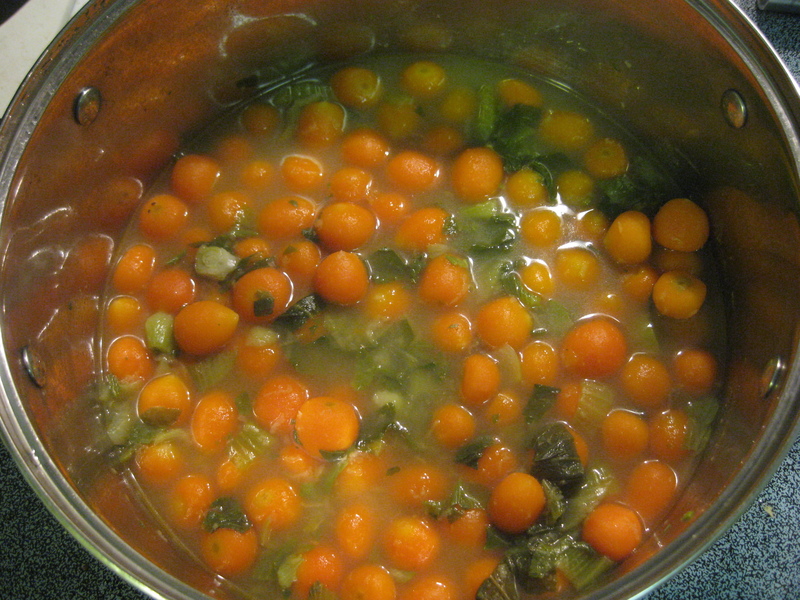 Cover and simmer, stirring occasionally, for 30 minutes or until the carrots are fork-tender. 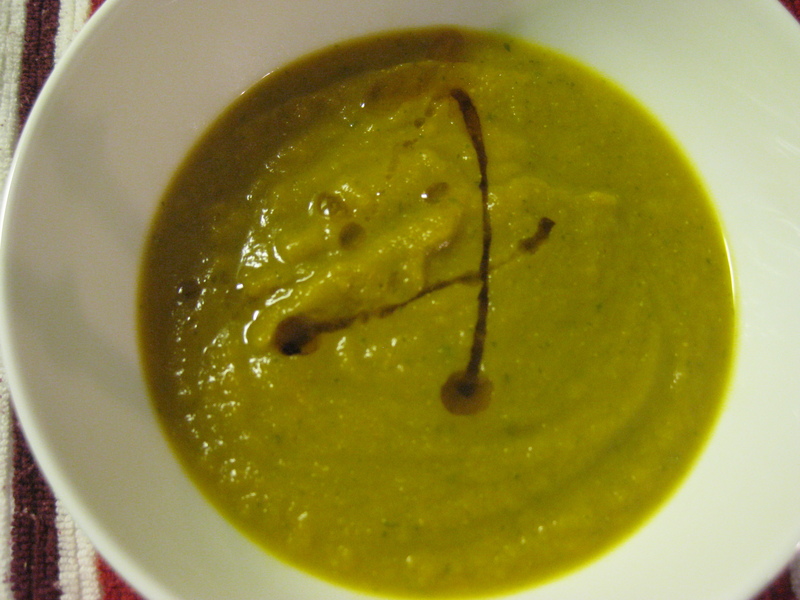 Remove the soup from the heat and puree with an immersion blender. Return the soup to low heat. Heat half a cup of water in the microwave for 1 minute, and stir in the miso until smooth. Add the miso mixture to the soup and blend until completely incorporated, adding another one-fourth to one-half cup of water to reach your desired consistency. Allow the soup to warm in the pot for a few minutes. Ladle the soup into bowls and garnish each with a half-teaspoon drizzle of sesame or lemon oil.